He’s back in light training and just doing maintenance work, and Sherman is just going to play it by ear regarding his next start, saying there is “a chance” he’ll run in the Santa Anita Derby. This is an old school, blue-collar horse with nine starts and a strong foundation under him. With three monster efforts in a row, there is nothing wrong at all if he regresses a bit in the Santa Anita Derby. The ultimate goal with these preps is to get a horse to peak on the first Saturday in May. Since 1990, Mine That Bird, Street Sense, Monarchos, Real Quiet, Grindstone, Thunder Gulch, Lil E Tee, and Unbridled all took steps backwards in their final prep before winning the Derby, so he has a race to play around with and use a steppingstone. But if Sherman feels it’s best to go eight weeks into the Kentucky Derby with no 1 1/8-mile races in him, then that’s what he obviously feels is best for his horse. But history has shown that horses do not win the Derby who have never had at least one 1 1/8-mile race. The only two in memory who have come remotely close are Risen Star, who was third in 1988, and Eight Belles, who was second to Big Brown in 2008. But Risen Star had five two-turn races under his belt and was gifted enough to win the Preakness and Belmont, and Eight Belles had six two-turn races. Before that, you have to go back to the third-place finish of Tom Rolfe in 1965, who was making his 16th career start in the Derby. Needless to say, it is a very tall order and a lot to ask, but we’ll see what Sherman decides to do. 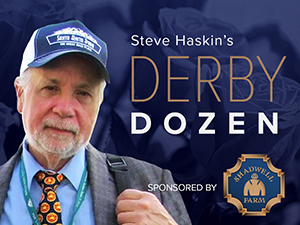 No one deserves a Kentucky Derby victory more than McLaughlin, who has put as much of himself into the sport as anyone, while overcoming physical adversity. He and the Maktoums have traveled a long and prosperous road together and this year could be the big payoff, just as it was for him and Sheikh Hamdan with Invasor. McLaughlin made some brilliant points on HRTV discussing the lack of points for certain 2-year-old races, but having to give away weight at 3 based on those same races. You can just feel McLaughlin champing at the bit as he waits out the final weeks of Cairo Prince’s layoff since the Holy Bull. You can bet he and the horse are anxious to get back into the fray and take that final step toward Louisville. While others around him crumble, Cairo Prince still stands tall and remains as strong as ever. McLaughlin will have him sharp and fit for the Florida Derby, but even if he does come up a tad short or runs into a freaky performance the way Honor Code did, he has enough of a foundation to move forward and be at the top of his game on May 3. McLaughlin was looking for a 1:01 work from him this week and he went in 1:00 4/5, so all systems are go. It’s funny how an owner’s mindset can change drastically from year to year. Last year, Starlight Racing had a brilliant 2-year-old champ in the precocious Shanghai Bobby, whose ability to get 1 1/4 miles was in question. Now, a year later, they have a horse who started out slow at Monmouth and took seven races to blossom into a leading Derby contender. And it was this colt’s sire who was Starlight’s first good horse, actually going off as the 6-1 favorite in the 2002 Kentucky Derby. Intense Holiday’s broodmare sire also went off as the favorite in the Kentucky Derby. I mentioned last week how election into the Hall of Fame has coincided with winning the Kentucky Derby (Wayne Lukas, Gary Stevens, Neil Drysdale). Well, there is an excellent chance that the Starlight-owned Ashado will be elected this year, so keep that angle in mind for whatever it’s worth. Intense Holiday continued his string of sharp works, going a bullet half in :48 breezing in company with Anchor Down, fastest of 66 works at the distance. He lost nothing in defeat in the Rebel, especially considering his horrible trip from the start, throwing his head up wildly when yanked back after almost running up on Ride On Curlin’s heels, then having to bull his way through a roadblock and getting turned sideways in the stretch when the two inside horses came out and Strong Mandate shoved him hard into Hoppertunity. He still kept battling and gained a great deal from this race. It was an excellent prep that makes him more of a serious threat for the Derby than he was before the race. This is a game and consistent horse who keeps moving forward every race. Unlike the Southwest when he had a perfect trip, he faced adversity for the first time and proved what he’s made of. He showed he can play rough when a desperate Ricardo Santana, being hemmed in by Mike Smith, just stepped on the gas pedal and plowed his way through, shoving Hoppertunity out of his way. The first four came away with high marks and established themselves as serious Derby horses. And remember, he was giving five pounds to the others. All in all, it was an extremely encouraging effort. Just as I had mixed feelings about him running in that allowance race, I have mixed feeling about his performance. Getting beat 10 lengths under the circumstances wasn’t a major step backwards, but was it enough to help get him ready for a peak effort on Derby Day? He now has only one race to get battle-tested and dead fit, something he couldn’t have been going into this race, considering he had only six works in 3 1/2 months, with three of them being at 3 furlongs, two at 4 furlongs, and one at 5 furlongs. And he missed some training after suffering a physical setback, delaying his originally scheduled 3-year-old debut. He most likely was fit and sharp enough to win under normal conditions, but Social Inclusion made sure there was nothing normal about that race, as he simply ran Honor Code off his feet in a spectacular record performance. The question now is, did Honor Code get enough out of this race, in which he got a bit warm and balked at the gate, to compete with some very fast horses in the Wood Memorial and put himself in a position to win the Derby? I would feel a lot better about his first race back if he had two more races before the Derby, but he doesn’t, so McGaughey will just have to make the best out of cards dealt him. He has bounced out of the Fountain of Youth just the way you like to see, first with an easy :51 1/5 breeze and now a sharp :59 2/5 drill. The big news is getting Joel Rosario back for the Florida Derby. Rosario won his only start aboard the colt in the Gulfstream Park Derby. This is the race we should see a breakout performance from him if he can sit off the pace and settle this time. But we’ll see if Social Inclusion runs there or in the Wood Memorial. Both races should have a lively pace. If you like to see steady progression in speed figures, his Beyers have gone from a 65 to 81 to 92 to 101, and I don’t believe we’ve seen the best of him by any means. If you saw his explosive move in his career debut at Keeneland, you’d realize there is another side to him we haven’t seen since blinkers were added. This horse might be more talented than people think. He’s just been in situations where he’s had to do the dirty work and keep Wildcat Red from stealing off on an easy lead. Breezed an easy half in :50 1/5, as racing’s Frequent Flier prepares for yet another plane flight to New York and his third showdown with New York-bred rival Uncle Sigh in the Wood Memorial (gr. I). But Honor Code and others should make this one even more fascinating. It is important to keep remembering this colt is undefeated in five starts and has shown a lot of heart as well as brilliance. He can beat you in different ways. His owner, Barnes & Noble head Len Riggio, has invested a ton of money in building up a classy broodmare band out in the Hamptons and in Kentucky and it’s good to see it finally paying off for him. The only horse he’s ever run in the Derby was Samraat’s sire Noble Causeway, and it came in a year when his trainer, Nick Zito, entered five horses. Violette also has had only one starter in the Derby – Read the Footnotes in 2004, one year before Riggio’s Derby debut. Samraat might wind up being more effective in a bigger field with contentious speed, so he and Uncle Sigh don’t have to take it to each other from the start. Breezed 5 furlongs in 1:01 4/5 at Belmont Park, his first work since the Gotham (gr. II). Contessa got him going his first three-eighths in :37 4/5 and coming home his final quarter in :24 flat, galloping out a strong 6 panels in 1:14 4/5. This was a perfect work for him. He had veteran jockey Nick Santagata aboard and he nailed it right on the nose. Contessa recalled back in 1975 when he was a hotwalker and Santagata was galloping horses for free. And now here they are nearly 40 years later teaming up on a leading Kentucky Derby contender having won over 6,200 races between them. Last year at this time, Contessa was on the Derby trail with a gifted colt named Rydilluc, but nothing worked out for the horse in the Blue Grass Stakes and he missed his big chance. Now Contessa has another shot a year later, and so far he is doing everything right with Uncle Sigh, who is one solid effort away from giving his trainer his first starter in the Derby. Tuned up for the Spiral Stakes (gr. II) with a 7-furlong drill in 1:28 flat at Golden Gate. He has run well on the dirt at Santa Anita, Hollywood Park’s Cushion Track, Del Mar’s Polytrack, Golden Gate’s Tapeta track, and now tries Turfway’s Polytrack. This is the kind of horse that trainers love having in their barn; horses who go out race after race and give their all over any kind of surface at any distance. As mentioned last week, he’s been in the money at six different distances from 5 furlongs to 1 1/8 miles. The Spiral looks like a fairly tough spot, with some talented horses trying to earn their way into the Derby over Polytrack, and as we all know, this was the last stop for Animal Kingdom, who was making his stakes debut and competing on his third different Polytrack surface. If you love this track, it’s a one-way ticket to Louisville, and so far, Tamarando hasn’t found a track he didn’t love. Maybe I’m getting caught up in the moment when it comes to the Rebel, but I couldn’t help but be impressed by the first four finishers, who did finish 7 1/4 lengths clear of the fifth horse and all earned impressive enough Beyer numbers. Pressuring Strong Mandate on the lead from the inside is not his game, but he hung tough the whole way and kept battling, despite coming out a bit in the final sixteenth. This is a colt who rallied from eighth, 10 lengths back, to finish a close third in the Champagne Stakes. He had a terrible outside trip in the Southwest, in which he lost a ton of ground and was forced to make a premature move entering the backstretch, and now he had to break from the inside and sent up to eyeball a top-class horse in Strong Mandate every step of the way. He’s starting to remind me of Oxbow from last year’s Derby trail. I just want to see what this colt is capable of with a clear off-the-pace trip. One thing, though, he is 0-for-3 at Churchill Downs. He hasn’t run poorly; he just hasn’t shown much spark over that track, getting beat as the even-money and 2-1 favorite. In continuing HOPPERTUNITY’S performance in the Rebel, the way Mike Smith, who rode a brilliant race, was hitting him with steady right-handed whips down the stretch, it indicated that the colt was not drifting in and in fact was maintaining a straight course and actually was being shoved out by the chain reaction inside him. Baffert will now have to decide whether to ship for a third time, most likely back to Oaklawn for the Arkansas Derby or stay home and run against California Chrome and Candy Boy in the Santa Anita Derby. He does have undefeated BAYERN, who has recovered from a slight setback, as a possibility for the Santa Anita Derby as well. The other option he is contemplating is training up to the Derby, which seems logical because of the number of starts he’s had already this year and the traveling he’s done. But as mentioned earlier with California Chrome, history is against him. If anyone can pull it off, however, it is Baffert. The bottom line is, it would be very rare to see two leading Derby contenders attempt it in the same year. If California Chrome doesn’t run in the Santa Anita Derby, it would be difficult for Hoppertunity to pass it up. Hoppertunity is a long-backed horse with the look of a stayer who blossomed quickly for Baffert in the month of January. His sire, Any Given Saturday, was a magnificent-looking son of Distorted Humor who annihilated Curlin and Hard Spun in the Haskell Invitational after suffering a bad foot bruise in the Kentucky Derby. His dam, Refugee, is a daughter of Unaccounted For, best known for his victory in the Whitney and close second to Cigar in the Jockey Club Gold Cup and third to Cigar in the Breeders’ Cup Classic. Refugee also produced multiple grade I winner Executiveprivilege, winner of the Chandelier Stakes and Del Mar Debutante and two other stakes, and was second in the Breeders’ Cup Juvenile Fillies. Unaccounted For is a son of Private Account, by Damascus, out of stakes-winning Mrs. Jenney, whose dam, Mrs. Penny, won the French Oaks and Prix Vermeille and placed in the King George VI and Queen Elizabeth Stakes and English and Irish 1,000 Guineas. Hoppertunity’s tail-female line traces to Calumet’s Tim Tam, who won the Kentucky Derby and Preakness before breaking down in the Belmont Stakes and still finishing second. Hoppertunity’s third dam is Calumet’s great Hall of Fame filly Davona Dale, who swept three different recognized filly Triple Crowns in 1979, and who produced the French-trained Le Voyageur, third in the Belmont Stakes behind Easy Goer and Sunday Silence. The spectacular victory by SOCIAL INCLUSION in a Gulfstream allowance race was nothing compared to the post-race frenzy that had racing websites all across the country busting out with superlatives and lofty predictions. Not to mention the million-dollar-plus offers pouring in for the colt. Everyone had seen the second coming and could barely control their exuberance. The swift son of Pioneerof the Nile, coming off a brilliant maiden score going six furlongs, simply ran the favored Honor Code off his feet and coasted to a 10-length victory in a track record 1:40 4/5 for the 1 1/16 miles. I have no idea what the long-range future holds for this colt, but for now he is officially on the Derby trail, despite making only his second career start, joining other brilliant colts, such as Bayern, Constitution, and Anchor Down, as possible Derby-bound horses trying to take home the roses off only three career starts. All the horses mentioned above made their career debut in a sprint this year, and to provide an unwanted jolt of reality, you have to go back to Regret in 1915 to find a Derby winner with three career starts who had as few as two two-turn races prior to the Derby. Big Brown captured the Derby with only three career starts, but they were all around two turns, and the first was at 2. And we all know by now that the last horse to win the Derby without starting at 2 was Apollo in 1882. So these colts, as gifted as they may be, will be attempting to do two things that haven’t been done in 99 years and 132 years. The way racing has changed, and with the number of never-been-done feats being done, nothing is impossible anymore. But no matter how you look at it, it’s still a lot to ask of a young, inexperienced horse, as exciting as he may be. On the other hand, who knows, perhaps Social Inclusion or one of the others is the second coming. This colt does look freaky, but I’ll wait a little longer and try to get a better feel for him after majority interest is sold this week before putting him up there with horses far more experienced and accomplished. Let’s see where he winds up first. But the main reasons he’s not yet on the Top 12 are the following: Wildcat Red, In Trouble, Albano, and Constitution – fast, classy horses who have not yet proven they can lay off the pace going two turns, along with Uncle Sigh, Samraat, and General a Rod – fast, classy horses who are comfortable on or just off a fast pace. First, I need to see if Social Inclusion can lay off horses like these, because it’s going to be even more difficult for him trying to win the Kentucky Derby off three career starts if he has to be on the lead. It’s a far cry from having an uncontested lead in a five-horse allowance field over a speed-favoring track and bullring-length stretch to winning at 1 1/4 miles in a 20-horse field filled with speed horses. For rankings sake, let’s put him at No. 13 this week and see where we stand next week. Also very close to making the Top 12 are RING WEEKEND and KID CRUZ, two horses with tremendous upside. Both are making great strides at the right time. The more I watch the Tampa Bay Derby the more impressed I am with Ring Weekend, who covers a lot of ground and drops his head and shoulder beautifully. My only issue with him right now is his difficulty in changing leads. Alan Garcia had to force him to switch in his maiden victory and he never did at Tampa. But it might have been a case of just not needing to, because of the momentum he had built up. And I did love the way he galloped out. But you really would like to see them switch leads. Expect to see him on the list in the near future. Kid Cruz also intrigues me a great deal, and more on him in the coming weeks. On the heels of Declaration of War’s super effort in the Breeders’ Cup Classic, watch out for BC Juvenile Turf runner-up GIOVANNI BOLDINI in the UAE Derby. His pedigree (War Front, out of an Old Trieste mare) screams dirt, so, you never know. Aidan O’Brien could have another in the UAE Derby who bears watching if he can run huge, and that is MICHAELMAS, a son of Elusive Quality, out of a Lemon Drop Kid mare, so, he, too, should eventually handle the dirt, but it depends on how far he wants to go and if he can handle the Tapeta first. So far, he’s only been sprinting. Baffert worked Robert Lewis runner-up CHITU five furlongs in 1:01 2/5 and then seven panels in 1:24 4/5 in preparation for Sunday’s Sunland Park Derby. He may be joined by MIDNIGHT HAWK, who would be coming back in two weeks following his distant second to California Chrome in the San Felipe. He also was sharp, working 5 furlongs in 1:00 1/5. WILDCAT RED indicated his sharpness for the Florida Derby, working a half in :47 4/5 at Gulfstream, his first work since the Fountain of Youth Stakes. Todd Pletcher worked his pair of undefeated Florida Derby possibilities at Palm Meadows, with CONSTITUTON going five furlongs in 1:01 2/5 and ANCHOR DOWN a bullet half in :48 flat in company with Intense Holiday. Also on the Florida Derby front, MEDAL COUNT, fifth in the Fountain of Youth at 43-1, drilled five furlongs in :59 flat for Dale Romans. It looks as if Pletcher’s Tampa Bay Derby runner-up VINCEREMOS will follow in Palace Malice’s footsteps and try to pick up enough points to get in the Derby in the Blue Grass Stakes, despite never having run on Polytrack. However, he did work like a monster on Keeneland's Polytrack when he was sold as a 2-year-old, so he certainly has that in his favor. Pletcher also will be represented in Sunland Park Derby by COMMISSIONER and GLOBAL STRIKE. The former breezed 5 furlongs in 1:01 2/5. Pletcher also breezed Spiral Stakes hopeful WE MISS ARTIE a half in :49 2/5. An interesting horse heading to the Sunland Park Derby is impressive Santa Anita maiden winner GAREN, who is a half-brother to Horse of the Year and Hall of Famer Invasor. Getting back to the Rebel, STRONG MANDATE ran a gutsy race, under pressure on the lead the whole way and getting bounced around in the stretch. But I didn’t like seeing him on the lead. If he is to be taken seriously as a Derby contender he has one race left to show he can be effective coming from off the pace and closing down the lane. It appears as if this is a horse still searching for an identity. Remember WICKED STRONG, the horse I was contemplating ranking No. 1 for the first Dozen? He did rebound off his dreadful performance in the Holy Bull to run a solid fourth in that high-class allowance race won by Constitution, and he did return to the work tab recently with a sharp half-mile breeze in :48 1/5 at Palm Meadows. I still can’t help but wonder if Gulfstream simply is not where he wants to compete and that a return to New York wouldn’t move him up considerably. But who knows? Another horse who has been under the radar since his second-place finish to Constitution in an allowance race in TONALIST, who had an easy 5-furlong breeze in 1:03 for Chris Clement. It wouldn’t be wise to underestimate this horse, who could pop a big one at any time. MEXIKOMA, who was laid up with a lung infection and fever, has improved and is back galloping. He is still on schedule to breeze March 22 and 29 and then run on April 5 or get in another work and wait until April 12 for his Derby prep. It’s going to be tight making the Derby, especially only running hard for about a quarter of a mile in his last start, but is still doable. He would have to do some serious sustained running, however, to be ready for the Derby and have a chance to pick up much-needed points. And he does have that in him. Wood Memorial hopefuls on the work tab this week were IN TROUBLE, who breezed a half in :48 4/5 at Palm Meadows, and Jerome winner NOBLE MOON, who breezed a half in :51 over the Belmont training track. LeComte winner VICAR’S IN TROUBLE, who shipped to Gulfstream from Fair Grounds after finishing third in the Risen Star Stakes, breezed five furlongs in 1:00 2/5 for the March 29 Louisiana Derby. Tom Amoss breezed RISE UP, who finished seventh at 4-1 in the Risen Star Stakes after breaking poorly, a bullet five furlongs in 1:00 flat at Fair Grounds for the Louisiana Derby, fastest of 18 works at the distance. Also at Fair Grounds, COMMANDING CURVE, sixth in the Risen Star, worked five furlongs in 1:01 for Dallas Stewart and West Point Thoroughbreds. Others looking to knock off Intense Holiday are ALBANO, LOUIES FLOWER, and GOLD HAWK. The last named has been a disappointment lately, but has ability and tuned up for the race with a sharp six-furlong breeze in 1:12. He’s one of those capable of busting out at any time if he gets his act together. In the sneaky-good work department, COASTLINE fourth in the Southwest Stakes, breezed five furlongs in a bullet :59 1/5 at the Ocala Training Center. The enigmatic CASAGUAPO tuned up for a possible start in the Florida Derby by working a bullet half-mile in :48 3/5 at Calder.